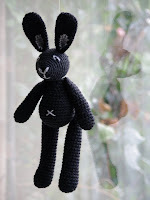 Meet Jay my new crochet bunny - another present for my nephew. His Mum and Dad have bought absolutely everything for him so a hand made gift was in order...and its in their favourite colour black so extra brownie points for me. Jay is worked with two strands of Sirdar DK black crepe. I wanted to use cotton but there was none in my local shop so opted for crepe remembering my Grandma's tip that it doesn't split like other yarns. To minimise holes and unsightly white filling against the black I doubled the yarn thickness and used 3mm hook. As per usual I like to freestyle. So made the pattern up as I went along. I've added extra details such as the 'J' on the bum, an 'X' for the tummy and cross stitch for the ears. This free pattern is for personal use only. 1. Yarn - DK two strands. But you could probably use 1 strand of the thicker worsted yarn which they sell in the states. All pieces are made in spirals. So do not join at end of row. Make magic ring or sloppy slip knot see tutorial from fresh stitches. This will be pulled tight to reduce the hole. Run yarn tail through the last round of stitches with tapestry needle, pull to close the opening. FO. Sew the hole shut tight. Leave long tail to attach head to body. Fasten off. Add cross stitch to ears if desired. Flatten, fold and stitch close ready to attach to head. Close. Leave tail for attaching to body. Close. Leave long tail for attaching to body. Attach ears and use embroidery thread to sew on features. Sew on legs and arms. Add tummy cross and toes as desired. Voila! Love this one, thanks !! 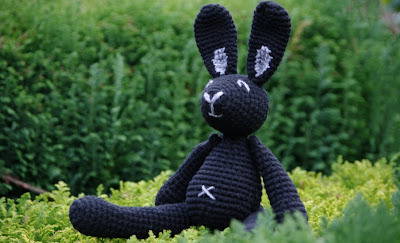 I'd love to crochet this beautifull bunny for a baby-boy. While reading the pattern I noticed that the ears-part is a bit short, only 3 rounds, can you please please tell me how to make the ears like you did? Because it looks so nice with the long ears, you really did a great job! If you want to, you can e-mail me, my adress can be found at my (dutch) blog. Thank you so much! Hi Anne. Glad you like the bunny. Not sure why I missed of the other rounds...ooops. I will check my notes and post an update. I would love to see a picture of the finished bunny if you make it. Hello, I've updated the ear segment of the pattern. Round 4 -17: dc in each stitch around. (18). I have done the body and head and just started on the ears. It just seems to be continuous rounds ; how can that make long narrow ears ? Continue in rounds to make your desired length. Fold in half and attach across the top of the head - front to back. Hope this helps.